Alzheimer’s disease and related dementias are recognized as an emerging health issue in Indigenous communities. Indigenous older adults are considered to be among Canada’s most vulnerable citizens because they often face complex health issues stemming from socio-economic marginalization and a legacy of colonialism, and they face a host of barriers in accessing healthcare. They have higher rates of many of the risk factors for dementias. As a result, the rates of ADRDs are expected to increase more rapidly among Indigenous older adults compared to non-Indigenous older. Despite this recognition, relatively little is known about Alzheimer’s disease and related dementias (ADRDs) among Indigenous populations in Canada. A new paper from the NCCAH summarizes what is known about the prevalence of ADRDs, the challenges associated with diagnosing dementias, and the risk factors associated with the development of dementias in Indigenous populations. The paper highlights several knowledge gaps with respect to the prevalence of various forms of dementia among the different Indigenous groups, as well as differences in the way dementias present in Indigenous populations. The paper concludes by highlighting the need for integrated multi-sectoral approaches to address socio-economic equities and health disparities as preventative measures for ADRDs. 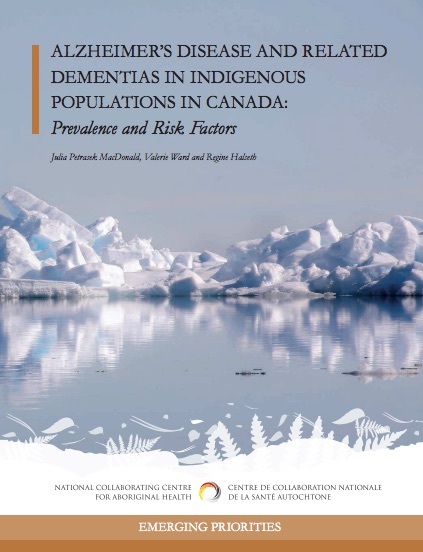 Visit the NCCAH website to download Alzheimer's Disease and Related Dementias in Indigenous populations in Canada: Prevalence and Risk Factors by Julia Petrasek MacDonald, Valerie Ward and Regine Halseth.